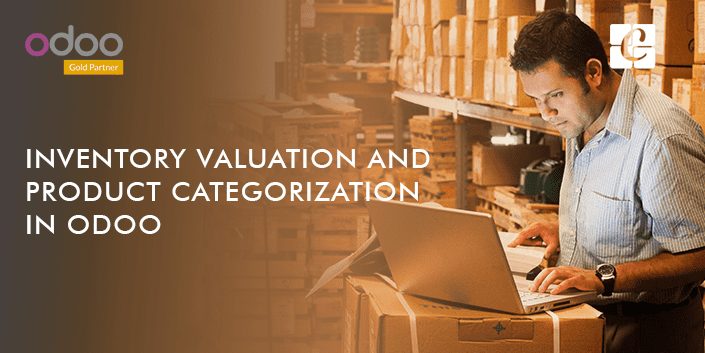 Having a precise inventory valuation is critical on the grounds that, it is the reported measure of the stock or the inventory that influences the expense of goods sold, the net profit, and the overall gain on the income statement. Also, the accurate inventory valuation measures the current resources, working capital, investors' or proprietor's equity reported on the balance sheet. 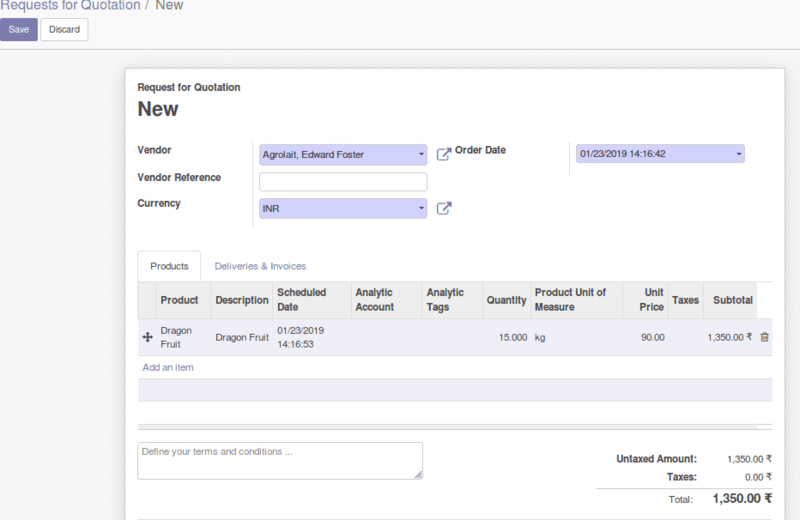 This blog tales you down how to configure inventory valuation and product category in Odoo ERP. 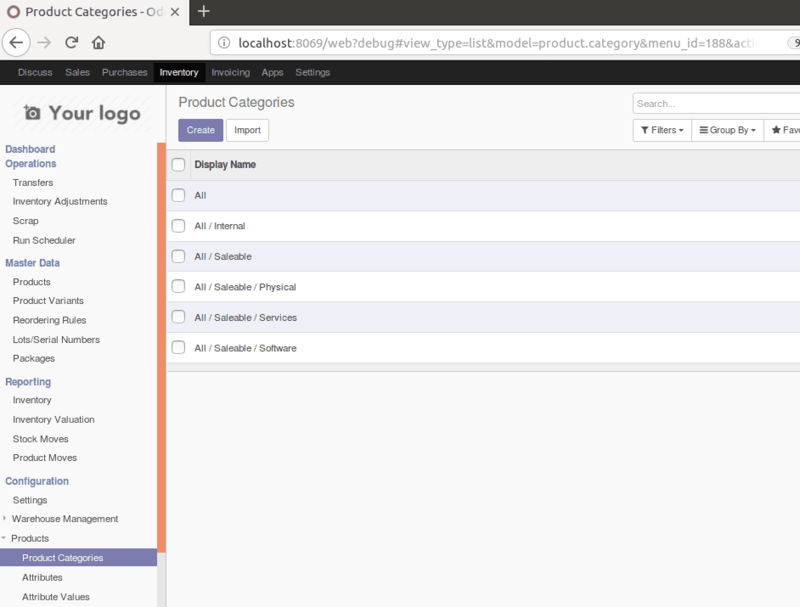 You can see the list of product categories in Odoo. Also one can create a new product category by clicking “create” button. Category Name: One can provide the new category name in the corresponding field. Parent category: One can create the hierarchy of the product category by choosing the parent category. Routes: Odoo enables the provision to define routes i.e. the option to describe a path for the product to move in accordance. Force removal strategy: Select a specific removal strategy that will be used regardless of the source location for the product category. 1.First In First Out (FIFO): The product which has arrived first will get removed first from the stock. 2.Last In First Out (LIFO): The product which has arrived last will get removed first from the stock. 3.First Expiry First Out (FEFO): The product which gets firstly expired will be removed first from the stock. 1.Standard Price: The products are valued at their standard cost defined on the product. 2.First In First Out (FIFO): The products are valued supposing those that enter the company first and will also leave first. 3.Average Cost (AVCO): The products are valued at weighted average cost. 1.Manual: The accounting entries to value the inventory are not posted automatically when a product enters or leaves the company. 2.Automated: An accounting entry is automatically created to value the inventory when a product enters or leaves the company. For example, if the end user created two products namely automated product (inventory valuation is automated) and manual product(inventory valuation is manual). Then these two products are sold. 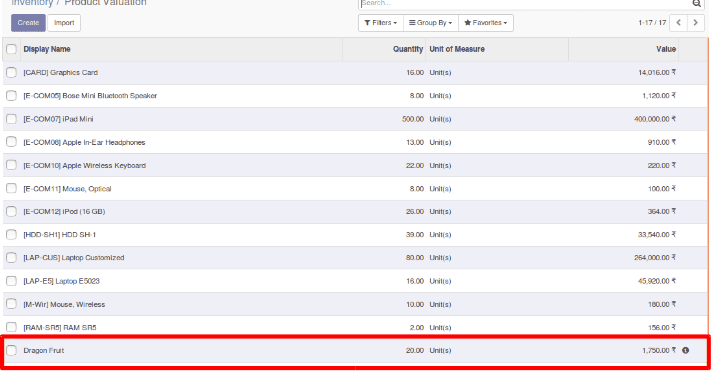 In the below picture you can see the sales order for the two products. 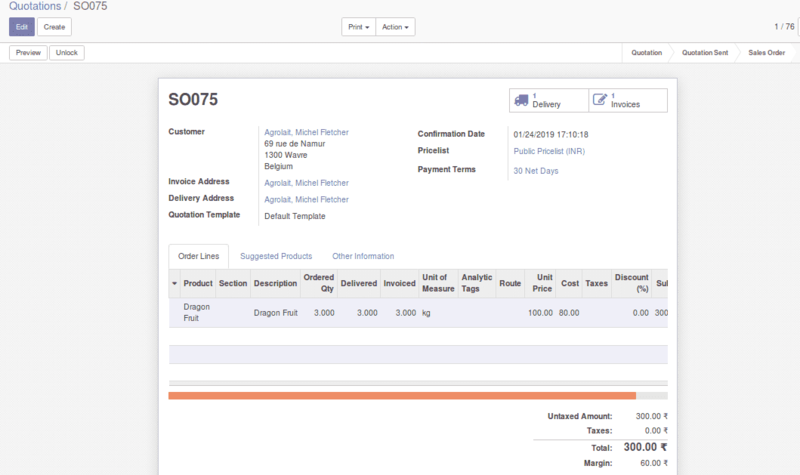 When you process the delivery, the accounting entries to value the inventory for the automatic product are automatically generated. 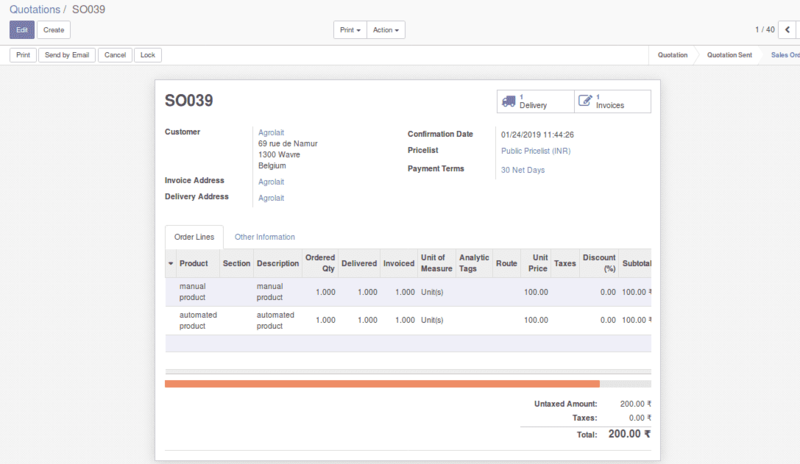 But for the manual product, accounting entries to value the inventory are not posted. 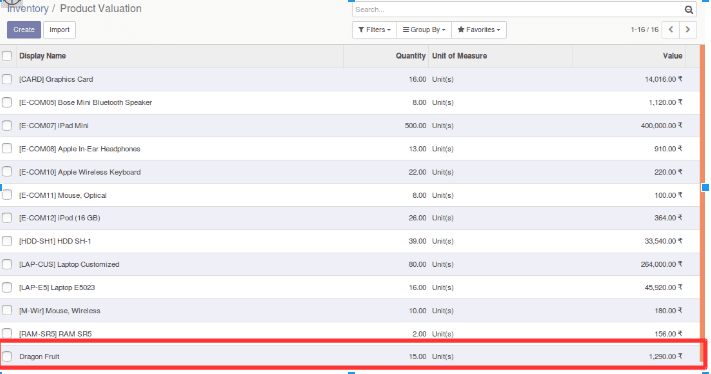 In the below image you can see the accounting entries to value the inventory for automatic products are posted. When you select a standard price as costing the cost of the product will not be changed automatically. You can only update the cost manually. By processing a sales order or purchase order it will not affect the standard price of the product. In the above image, the cost of the product is Rs 80. If you sell some product quantity, product cost remains the same. 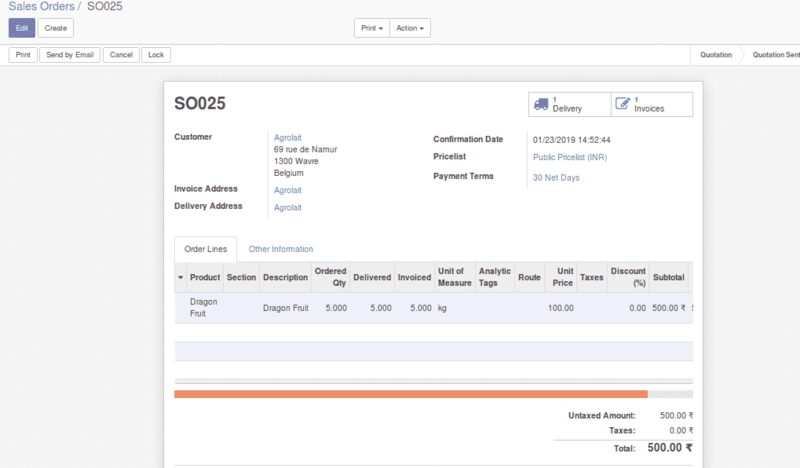 The above image shows that the sales order for the 3 Kg product (dragon fruit). After processing the sales order, the product costs remains the same. The below image shows the cost of the product, which is not changed after the sales. Then the cost becomes 86. When you choose the costing method as FIFO and thereby selling the product, then the product cost will change automatically. Here I am selling 5 products. (changed the costing method to FIFO). In FIFO, the product entering the stock will also leave first. So when I sold 5kg dragon fruits, it was taken from the stock in the purchased order. Which means products that I have purchased first will be sold first. Also, the cost of the product becomes the cost of the last moved product from the inventory. So the product cost becomes rs 80. Price Difference Account: The account will be used to value price difference between purchase price and accounting cost. The price difference account is only applicable to Anglo-Saxon accounting. If the price for a product in the purchase order and price in the purchase invoice is different, then the price difference account is used to hold the difference between these two product prices. Income Account: This account will be used when validating a customer invoice, which means it will hold the details of invoiced amount (without tax). If you process a sales order which contains different products of different categories, then you can use different accounts for different product categories. 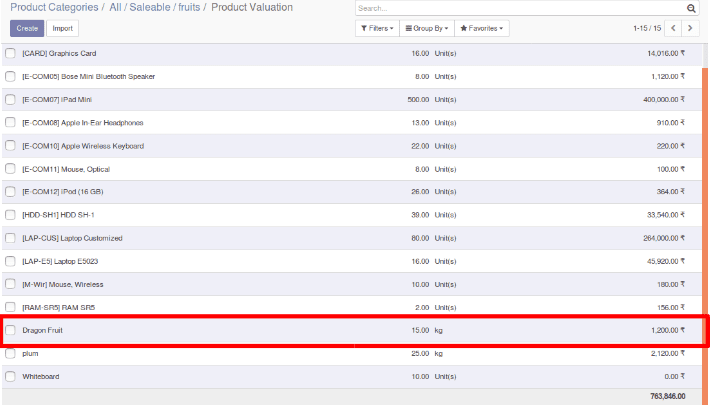 So that you can easily understand the accounting details(product category wise income) of different product categories. Expense Account: This account will be used when validating a vendor bill, which means it will hold the details of tax excluded amount in the vendor bill. If you process a purchase order which contains different products of different categories, then you can use different accounts for different product categories. So that you can easily understand the accounting details (product category wise expense) of different product categories. Stock Input Account: If you are doing real-time inventory all incoming stock moves will be posted in this account Unless there is a specific valuation account set on the source location. Stock Output Account: If you are doing real-time inventory valuation, all outgoing stock moves will be posted in this account, Unless there is a specific valuation account set on the destination location. Stock Valuation Account: If you are doing real-time inventory valuation, this account is used to hold the current value of the products. 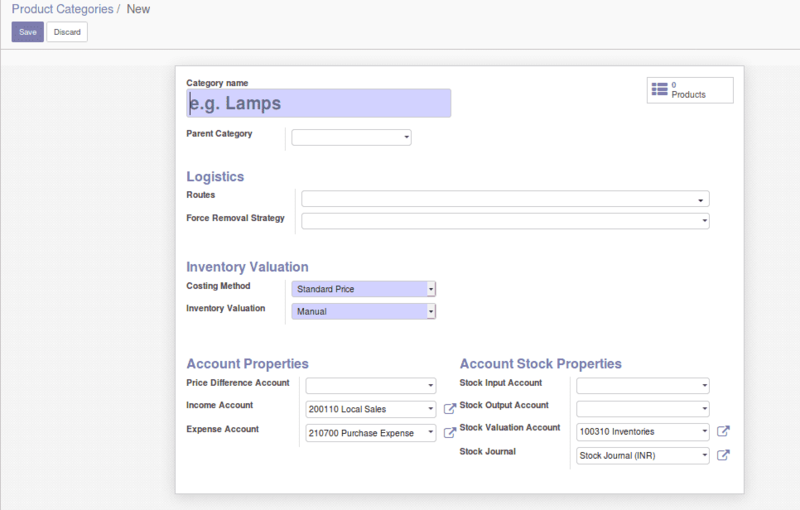 Stock Journal: When stock moves are processed all entries will be automatically posted in this account if the real-time inventory valuation is enabled.